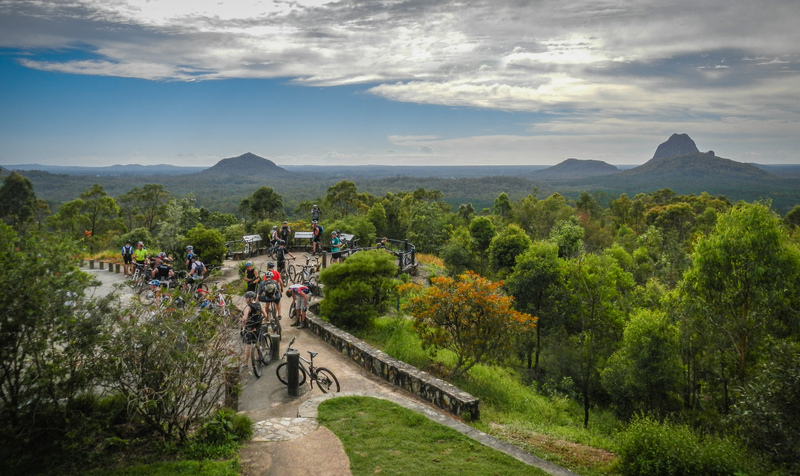 Would you like to join us for a fun social ride through the Glasshouse Mountains? When: 7.30am, Saturday, 20 August 2016. Approx distance: 70km with about 900m of elevation. We should be back by 2pm. “Secret Single Track” – almost 6 kilometres of twisting single track following some hidden creeks. The lookout track challenge. Who can nail the gnarly climb behind the lookout? For people who don’t feel comfortable riding 70km, the obvious bail-out point is Woodford. If you leave a car there you can finish up after lunch. We will ride clockwise from Beerburrum, up to the lookout and down Hennessey Hill then out to Woodford. We’ll do the “Secret Single Track” after lunch, and then come back via some tracks behind Mount Beerwah. We’ll return via Glasshouse Township in case anyone needs a break. These tracks can be adversely affected by wet weather so we may make minor changes to the route several days before the ride in the event of wet weather. Social pace. We won’t leave anyone behind. You can refill water at Woodford. Although there are a few water taps at other places throughout the ride, they’re not officially “drinkable”. The route includes a few km of paths / bitumen roads around Woodford. There are a few steep climbs. There are a few steep descents. There are one or two places you might get your feet wet. Whether you’re a novice or a ninja, this ride is always fun, usually with a large group of people. Last time we had about 70 people of all different skill levels. Thanks for organising this ride. Expecting to bring a few riders from Sunshine Coast Bicycle Touring Club. Appreciate your comprehensive and helpful web site. I look forward to seeing you and your friends on the day. A lot of it would be do-able on a CX, but there are some muddy bits and one long sandy section that you might find difficult. Warren did it on a CX last year, and got back tired and happy. He had to walk a few sections but had a great day. Thanks Neil, Darb, Eric, and the chap with all the water who needs to ride again! And the company of back markers I was with! !